I make it out the door to the El station. It's a hot summer day in 1955. 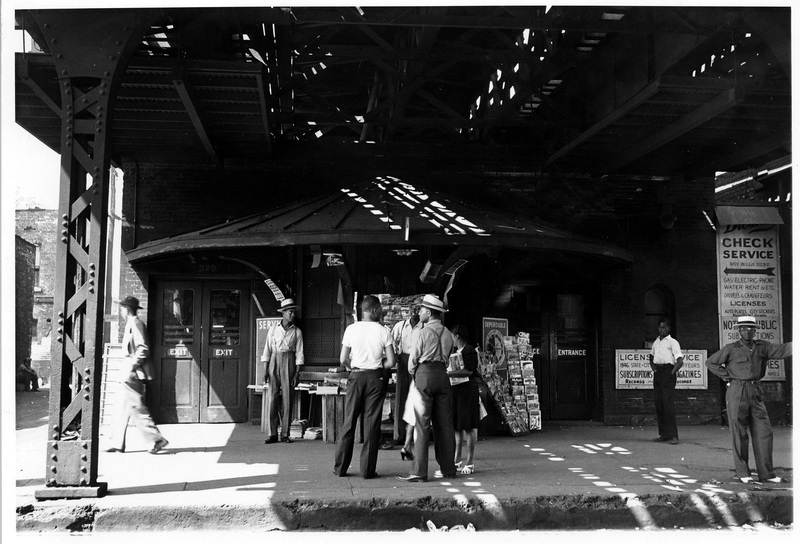 Heat waves jump off the El tracks. Where angels live in dejection. Ragged wash hangs there: grey t-shirts without arms. Next come vistas of wrecked cars and the bolt factory. From hell, her torso a red streaming suture. But the next night I'm back on the train to the ballpark. As a raw youth I had work for several years that took me all round the city on the rail transit system. The poem revisits a period when I worked regularly at Chicago's two major league baseball parks, Comiskey Park on the South Side and Wrigley Field on the North Side, as well as at, among other places, the Chicago Stadium (boxing, hockey, political conventions), the old Amphitheatre in the reeking shadow of the stockyards (where wrestling shows took place), two major racetracks (Arlington Park and Washington Park), the old Arena at 11th and Wabash (roller derby), the Merchandise Mart (furniture conventions), two golf courses (PGA tournaments), several South Side neighborhood dance halls (Friday night mayhem), and a very strange almost-completely-deserted private museum in a onetime Hyde Park mansion (suits of armor, stuffed birds, duelling pistols, and the adults-only piece de resistance, a chastity belt on a weird plaster mummy-woman propped on a dais in an alcove at the base of a spooky spiral staircase... jeez, no wonder my growth was stunted). From my home on the West Side I rode the Lake Street line downtown, then changed trains. The photos here were picked because at one time or another, in the course of the abovementioned work, I rode those trains. The work was, as can be imagined, educational. It seems curious to me now that I took for granted the fact of a citywide, inexpensive, relatively efficient transit system. It got you there. 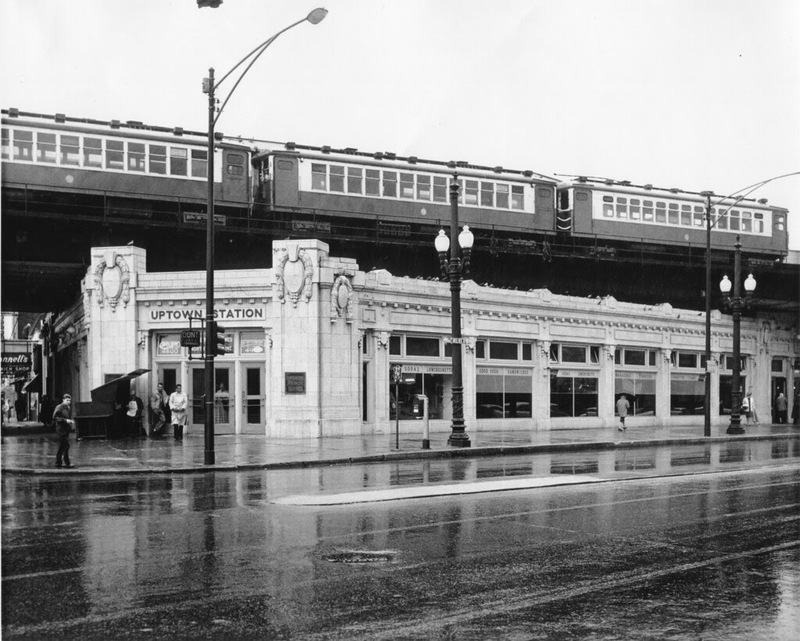 Even in sleet and snow and storm... and one night, a flood that drowned the Lake Street line between Austin and Ridgeland, stopping the train, and necessitating a spell of wading in deep water, where formerly streets had been. Swinging round some of those sharp corners, up there on those rickety old elevated structures, was an experience that always increased one's appreciation of the stability of solid pavement, later. And negotiating the Byzantine walkways over the tracks at the South Side stations -- one thinks now of Escher, and the enclosed bridges of Venice -- could be pretty challenging, particularly when you could see your train coming, down below. Scary merely to think of it now (can't do stairs). There's something really wonderful about riding the train through a city at night -- so much mystery opening up along the edges. I never had any good reason to do so, but when I was in my teens and twenties, I did it as often as I could. 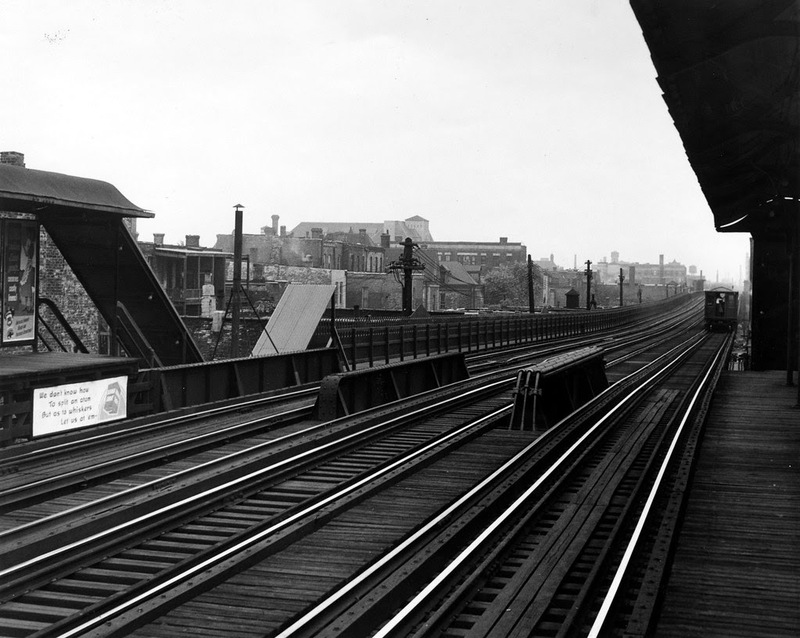 Boston's transit system has gotten a lot cleaner and better since I was younger, and I miss its rickety old elevated stations, especially the one by Boston Garden. When they were tearing the stadium down, you could look right down into it from the platform. And I can't think of a good segue for this, but thinking of the old platform (now gone) and the demolished Boston Garden always makes me think of this monkey. That poem approaches the ineffable in the persistent irresistible way a slow night train approaches the ineffable. "The girl who doesn't want her name mentioned told us that she met the worker who found the Boston Garden Monkey. "She interviewed him on video and it turns out that he hid the monkey up in the rafters and then took it home when no one was looking." Jeez. Creepy. If one believes in reincarnation, especially. 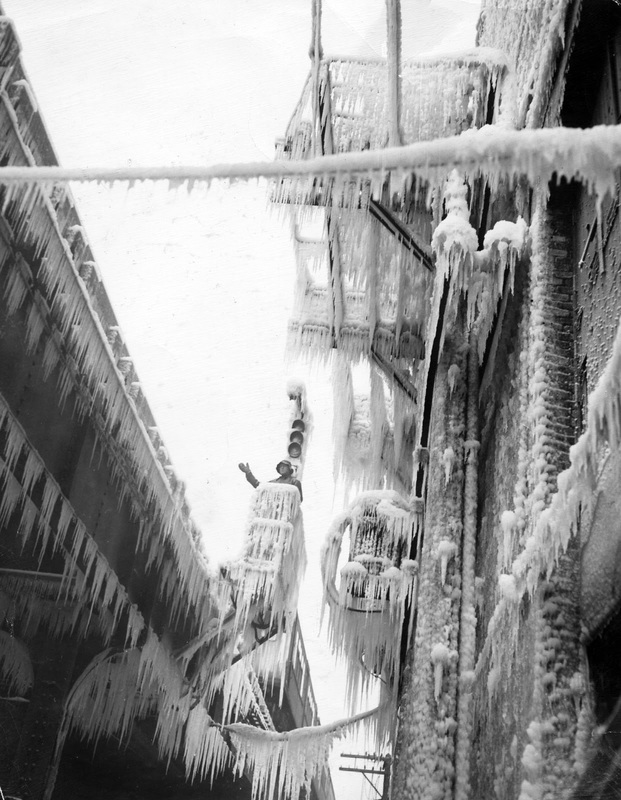 There was that poor guy in the 1940s who got stuck all night on the MTA. In an odd way, I had wondered whether, or perhaps indeed hoped that, the monkey's ghost would have been respected at least to the extent of permitting him to spend eternity riding the night trains down there with Charlie. Night trains, yeesh. One remembers all too many of those, suddenly. 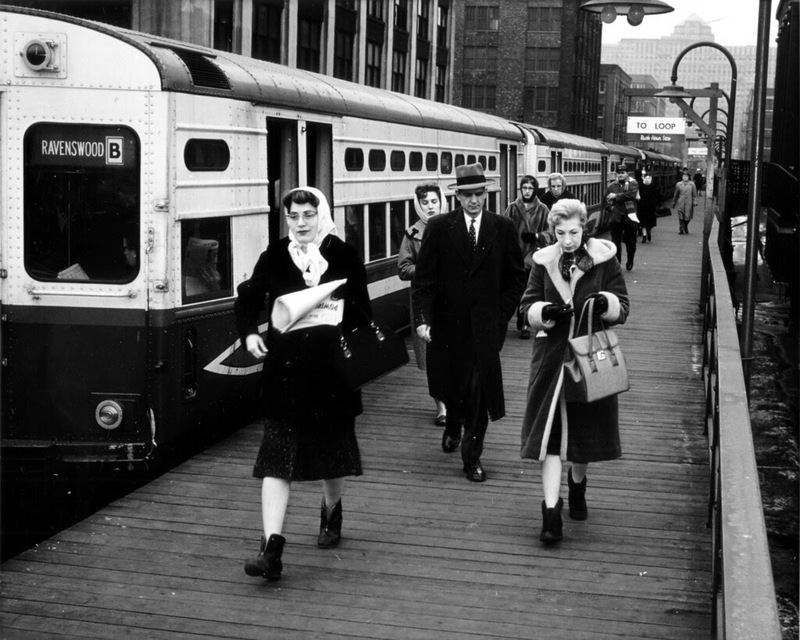 Once in 1950s rode a New York Central train all night to Detroit while reading Céline's Journey to the End of the Night, the perfect night train book. This bit of Nabokov on night trains isn't half bad either. Very nice post, Tom. Dejected angels down amid the backlit detritus of civilization. 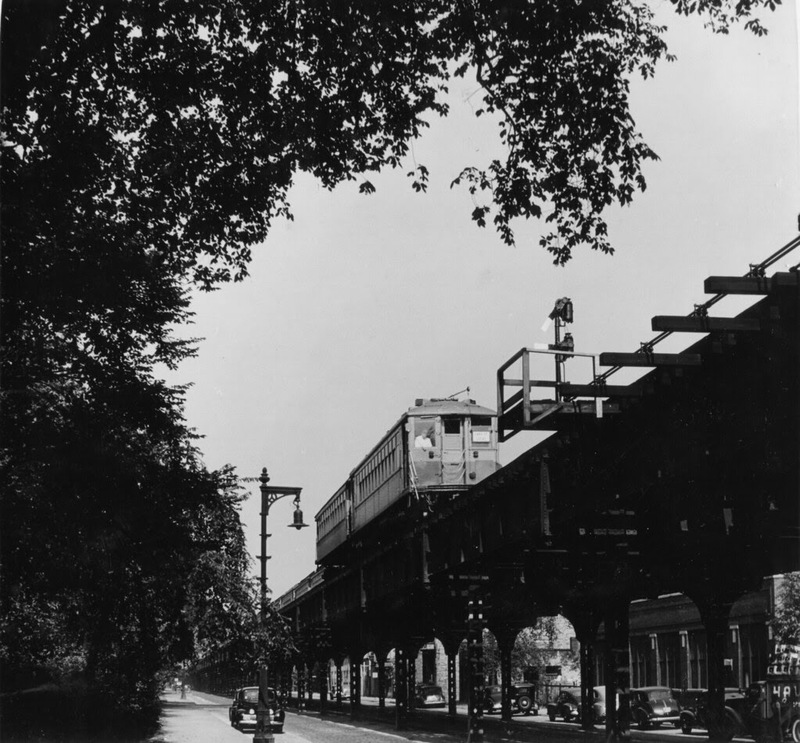 I’ve always been interested in urban transit systems, maybe because of the absence of them in my youth, though I do recall fondly riding on a trolley car with my grandfather. Nowadays, not so much. It’s the mass in mass transit . . . One ferociously hot summer in Budapest (a city, then, virtually without air-conditioning or fans) we used find relief down into the metro stations, where we'd wait for the trains to arrive, pushing a wave of cool air in front of them. At one time I was a constant rider of the underground train systems of London and Paris, but I had never experienced a true human crush until, one hot July, I was forced to rely for a while on the underground railway system of Madrid. Odd now to recall these histories. 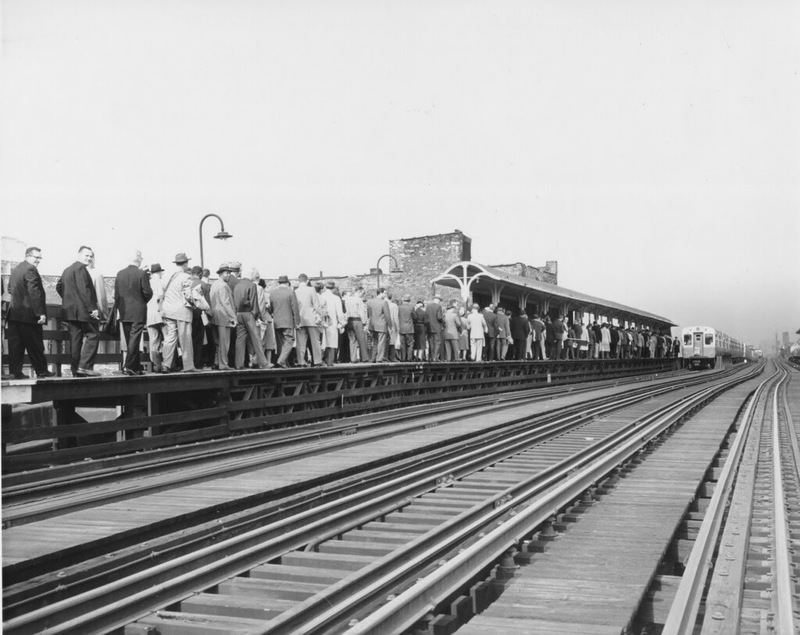 As can be seen in the photos, in Chicago the rail system hardware was then still intertangled with the hardware of the previous city transit system, the trolley lines. 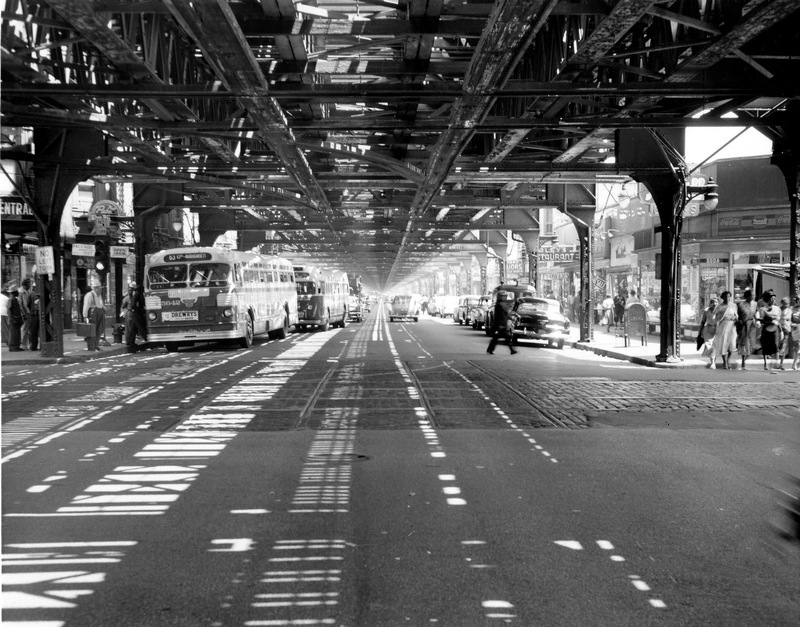 In the second shot you can see the old trolley rails in the street, a common sight in that era. 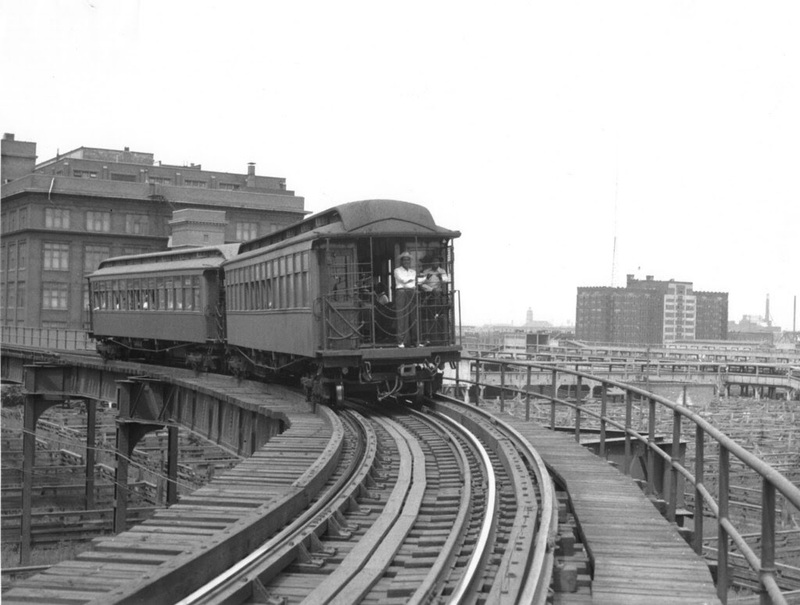 My paternal grandfather had driven one of an earlier generation of streetcars over those same tracks. He was a robust young Irishman who had done hard work in the Dakotas, but that job, he later said, was the toughest he'd ever had. 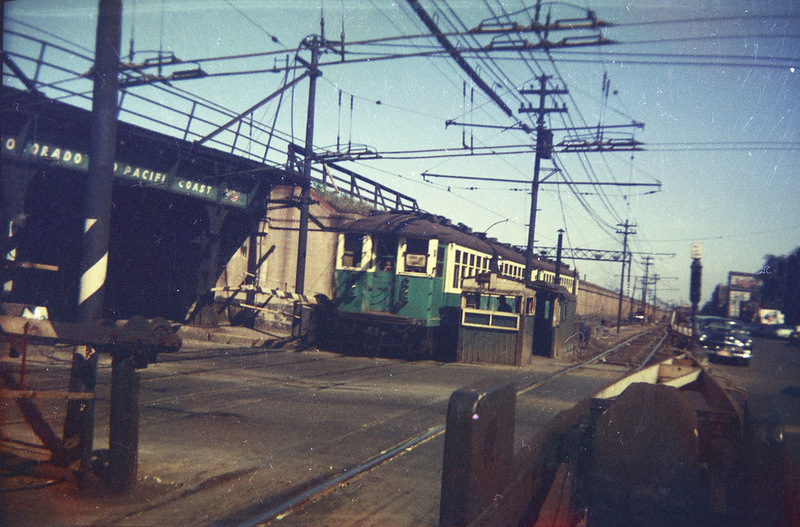 The electric wires are still visible and in fact were still in use at the time of the penultimate shot here, which shows a Lake Street train pretty much like the one I would have been on at about that time, in pretty much that same place. 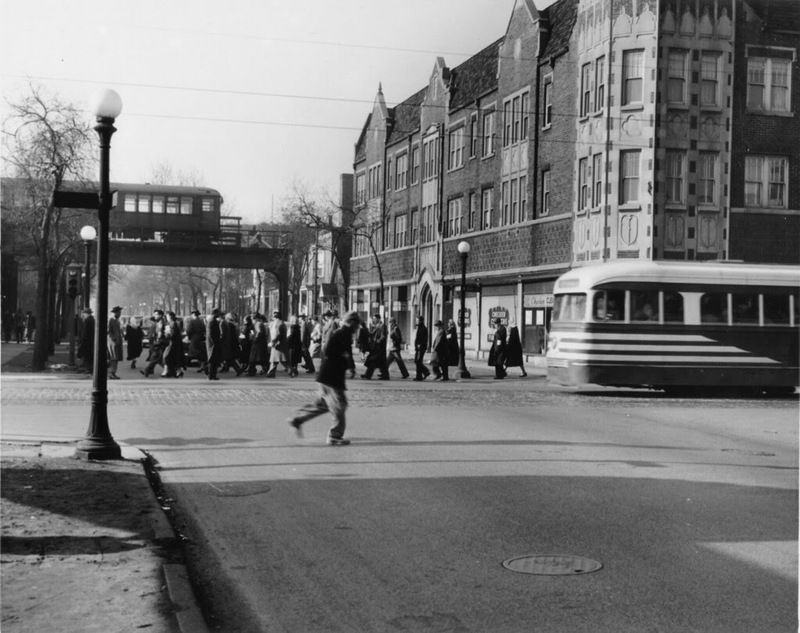 Five photos above that, the Lake Street line is seen as it elevates, a little further on its way through the West Side; and a few miles further to the east came the grey t-shirts and the bolt factory. It's interesting to consider the way competition from rival transit systems encouraged better service from the emerging and eventually dominant system. And to keep in mind that these developments were occurring prior to and apart from the increasing dependence on the private automobile as primary transport. But of course all this was going on in a city that had in place various urban transport systems dating back to the latter half of the 19th century. In California meanwhile the freeways created an illusionary alternative, but with time, these fast-lane death-traps, once regarded as one of the crowning miracles of American Progress, became themselves a major source of trouble. Lately I noticed a side-margin news item indicating that for citizens of the Bay Area, traffic and parking are life's #1 worry. Considering the dire shortage of medical care and decent housing, that says quite a lot about the social uses of the automobile. Up the freeway feeder a little way there's a traffic circle that, back in the day when such statistics were first being kept, handled about 30,000 cars a day. Now it's up over 100,000 and counting. Cars are still the #1 transportation option. Public transport is a massive problem in perpetuity, with operations always risky, and strikes and threats of strike a continual worry. Without a car and with significant health issues, the old folks here are continually challenged with having to find ways to travel long distances through urban wastelands to get to the places that would have been thought of as necessary rather than optional destinations. It's not a good arrangement -- but then all these arrangements are predicated on the assumption that the providers of "public" transport must extract satisfactory private profit, a pretty strange assumption when you look at it from any distance at all. And of course it's not easy to achieve that distance when you're looking through the windshield of your car. Right. See above comment, where "stuck on the MTA" is highlighted. It's a link to that song. There are these newfangled code thingies you can put around a link, so that other people can use it. I'm always hoping they will, once I've taken the trouble. That song sticks in my old craw, too. There's some lore suggesting the guy didn't have a wife to kiss goodbye, that he was actually just a bum riding the trains all night. Harumph, the things people do and say. Anyhow what gets me now is the fare mentioned in the song. Back on the train to the ballpark! This poem and the gorgeous collect of photographs pushed a lot of buttons for me. 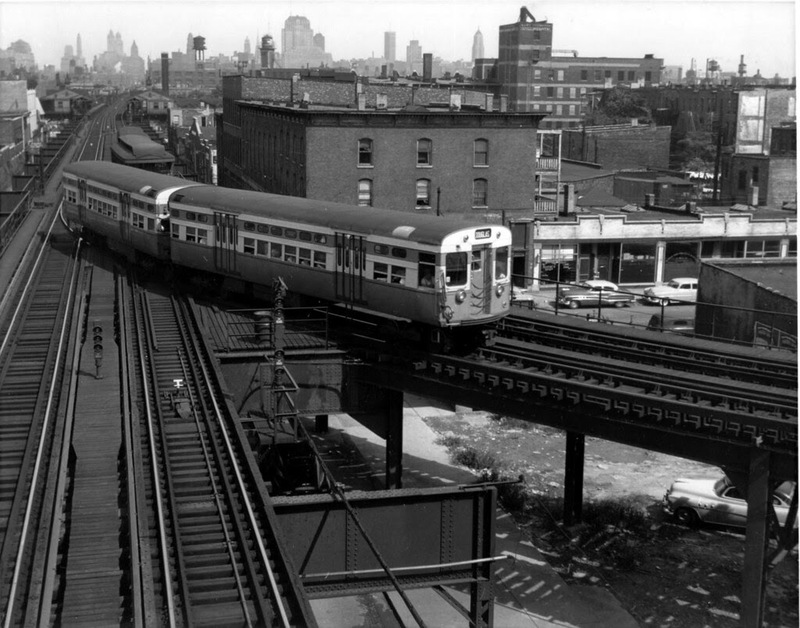 When I first lived in New York, I'd take the 7 train from midtown to Shea Stadium (sadly replaced the corporate friendly CitiField). Now I live a quarter block from the same line and still choose it over going below ground on the E or F trains, although they are express. Lovely post! 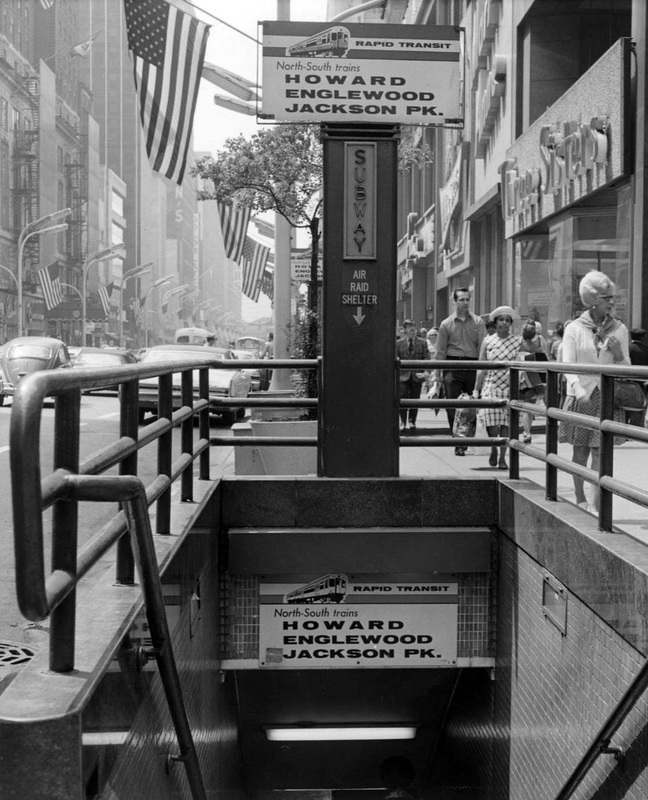 A few years back, the subway switched from tokens to "Charlie Cards," meaning every commuter has that darn song in their head forever. Also, having clicked on your link earlier today, I've spent the entire day wondering aloud how I'm going to visit my sister in Chelsea my cousin in Roxbury. Canal Street.... exactly where the # rd Avenue went..
now ? you gotta walk north from Vestry to get there.... or is that South? a transcript of this guy's dialogue would be Pure Poetry ! I can just imagine/visualize it in the form that Ted Enslin used in his Ranger..... or in his Synthesis..
all for "those who dig it" and can get lost in it. I had chosen to link to the track from the record rather than the not-quite "live" version of the Kingston Trio song. Doubtless everyone's on the edge of their loveseat wondering why that was. Partly because it's lip-sync'd. Partly also due to temporary cognitive burnout caused by the immense delayed flashback blast from a Kingston Trio concert at Ravinia in Evanston the year that song came out. Nothing like being among 500 little Dave Guards and their dates for two hours in a lovely open air setting to execute a permanent caution implant. Nora, I learn that the CTA is also gradually shifting over to electronic cards. Yeesh, I possess no card of any kind that an electronic device of any kind would recognize. I've never even had the courage to brave BART. Once I could no longer get around on my own, after that accident here, I became dependent on AC Transit. The horror. In the most recent fascinating chapter in my history of spinal degeneration, after two years of failed "rehab" following the car hit, a "setback" in the first week of February left me unable to manage the bus stop, much less the bus. Good news in that I'm now spared the horror of AC Transit. Bad news in that I can't get anywhere. David, I ought to confess that the example of your terrific blog, with its bemused micro-scrutiny of your own urban locale(s), probably contributed to this post, if only in encouraging admission to a residual interest in such shorings-up of what we remember on the shifting sands of where we are. 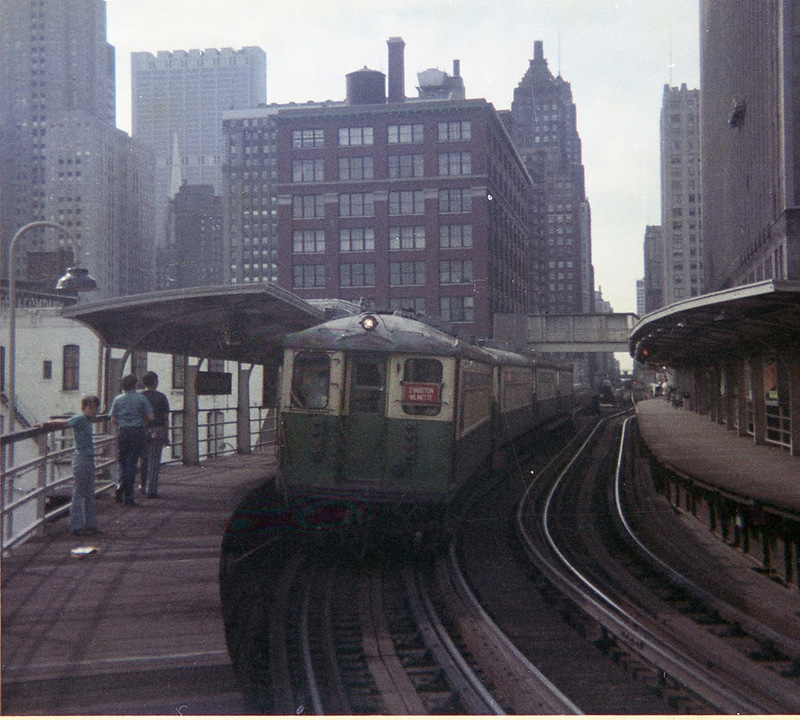 In the course of unearthing this slice of the past, I turned up colour footage someone had shot in the 1960s, recording the passage of trains on the Lake Street line. There's no sound. Everything is darkly wrapped in silence, as in old Russian movies made before the introduction of sound. The trains come by, the trains go by. It's wonderfully without temporal reference, except that from the cars in the street it's apparent that the date of the footage on the first part of the video is earlier than the given date of 1964 -- and this is confirmed by the fact that in that first section, the trains are still traveling on the ground, using overhead electric wires; in 1962, the Lake Street line was moved from ground level to the railway embankment above. What tore it for Charlie on the MTA was that five cent transfer. My kingdom for a nickel! But of course, Bahstun. It had to become a campaign song, in the mayoralty race of 1948. These Oirish chaps do a rousing return for your original dime. The present-day CTA, I discover, doesn't DO transfers. Hmm. Not much use the elaborate over-the-tracks walkway plan, then, thought architect Luigi Piranesi, rubbing his chin over the blue pencil drawing, and nodding to himself ironically, deep in the past. Catching up, then. No, I don't know if that would be Ted's Ranger or Ted's Synthesis. In fact, I don't know about you, big guy, but when I'm in Virtual Beantown, I just want to do Ted's Funniest Scenes. Otherwise, for me, when torn between a ranger, a synthesis and a forty-foot-high green wall with a guy talking funny inside, it's always going to come down to The Friends of Eddie Coyle.